Summary: Every year, The Turtle Hospital admits between 50 and 70 sick and injured sea turtles. Many of these turtles are found floating but with no visible signs of injury. The most reliable method for determining an animal's health is by analyzing their blood profile. This enables The Turtle Hospital to prescribe the best mode of treatment. The Turtle Hospital has the capability to perform all in-house diagnostics. To accomplish this, proper equipment must be utilized. Idexx VetTest and VetLyte machines allow staff to assess the condition of the animal. These machines require expensive maintenance protocols and test slides for each assessment. In addition, The Turtle Hospital performs a white blood cell count to determine if the turtle is fighting infection. 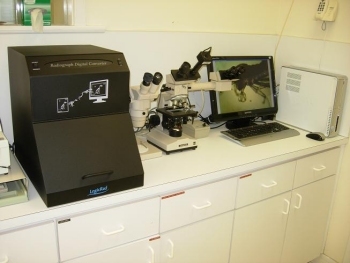 An initial WBC count can be accomplished with a Neubauer Hemacytomter, while a microscope count provides a detailed evaluation of each type of cell present. Equipment upgrades such as a microscope camera, x-ray scanner/converter, and a computer system to broadcast and store this information would enable The Turtle Hospital to provide the highest level of care and share this information with other people.